It’s time to give you the advantage over the competition with our plant and machinery auction software. Bring your auctions online and take advantage of the growing number of remote bidders demanding convenience and ‘virtual accessibility’. Selling your Industrial plant and machinery assets online allows you to attract a wider pool of long-term customers – beyond your sale yard, region, state or country. And the best part is it all runs from your own website. Timed or live webcast auction format? Once set up, timed auctions run on your website automatically. This gives you the time to focus on your auction marketing activities. List as many lots as you like, as many pictures as you like, multiple videos, multiple PDF’s and other marketing materials. Consider adding ‘buy now’ and ‘make an offer’ options. And of-course bid extension and lot staggering. New webcast technology means your bidders no longer need to waste time downloading apps. All devices including mobile now allow you to stream to bidders App-Free from your website. Remember the old way where bidders had to leave your site and download an app ? Imagine how many potential bidders couldn’t be bothered and left before bidding. The Webtron Photo Manager reduces the time taken to add photos to sales. Our multi-user app permits you to snap and attach photos of your plant and machinery assets using your mobile device. No internet connection? Snap now – upload later. Ideal when you are out on location or in a building. Upload your photos to the sale once you’re back in 3G/4G range. Multiple admin users can photo catalog on their mobile phones/tablets (Android & Apple) at the same time. 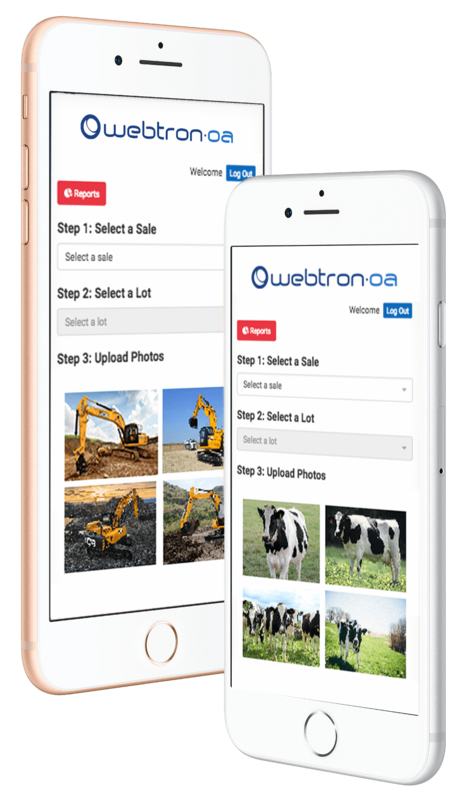 For a turnkey online auction solution for your plant and machinery business, Webtron is the answer. Contact us for a free software demonstration today.